Research into subjects as varied as how exposure to alcohol can affect the development of both humans and insects, as well as the impacts of trauma on vulnerable populations, will be recognized during San Jose State University’s annual Celebration of Research. 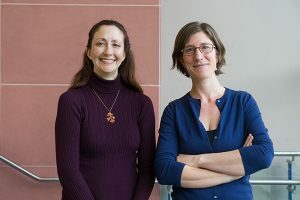 Receiving the 2017 Early Career Investigator Awards during the Feb. 16 ceremony at the Diaz Compean Student Union ballroom will be Rachael French, associate professor in the Department of Biological Sciences, and Miranda Worthen, assistant professor in the Department of Health Sciences and Recreation. French has generated more than $1.2 million in external funding to support her work examining how the development of the common fruit fly is affected by laying its eggs in the alcohol-rich environment of newly rotting fruit. Financial backing for her studies, which began when she was doing post-doctoral work at the University of California, San Francisco, comes from the National Institutes of Health and the National Science Foundation. She has three graduate students and six undergraduate students assisting her work. French hopes her research could lead to treatments for babies suffering from fetal alcohol syndrome. That would likely occur “way down the line,” she said. Worthen came to San Jose State in 2012 after earning a doctoral degree in epidemiology from UC Berkeley, a MPhil in international development from Oxford University and a bachelor’s degree in government from Harvard University. She described her research as wide-ranging, focusing on social justice and public health, specializing in the areas of gender and violence. She has raised “more than $100,000” for her projects, including from the federal Substance Abuse and Mental Health Services Administration and The Thoracic Foundation. Her interest in these issues was sparked at an early age. Her mother, Kaethe Weingarten, with whom Worthen has co-authored academic papers, is a retired associate clinical professor of psychology at Harvard Medical School. “My mother always impressed on me that your own personal experience can have an important impact on your research and the questions you ask,” Worthen said, who has published articles about her experience with trauma. Worthen and French were selected by members of the Early Career Investigator subcommittee, comprised of Research Foundation board members and faculty. One award goes to a College of Science or Engineering faculty member, the other to a faculty member in another college. Each winner receives a cash award of $1,000.